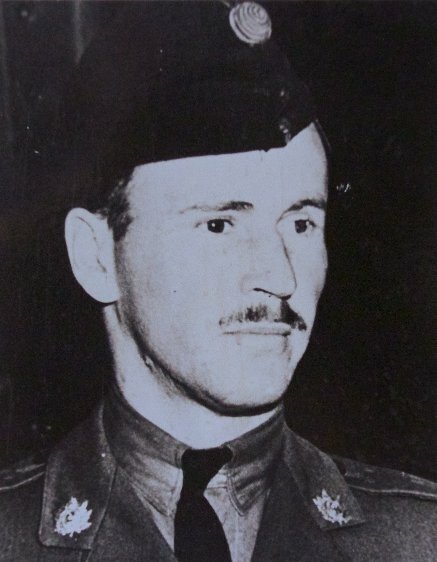 The Honourable Honorary Lieutenant Colonel Edward Arunah Dunlop, GM, OBE, CM (June 27, 1919 – January 6, 1981) was a soldier, civil servant, public servant (founding national director of the Canadian Arthritis and Rheumatism society) and a politician. He was born in Pembroke, Ontario, the son of Edward Arunah Dunlop. His early schooling was in Pembroke and at Upper Canada College. He took a B.A. degree from the University of Toronto’s Trinity College. Recognizing the Nazi threat, Dunlop joined The Queen’s Own Rifles of Canada in 1937 and served to 1944, reaching the rank of major. He was stationed in Newfoundland, the United Kingdom and was wounded while on special duty in North Africa (seconded to the Buffs). He returned to the QOR and commanded a company in Scotland when a training accident occurred, One of the men on the range dropped a live grenade. In a heroic attempt to protect his soldiers by shielding them with his body, he was blinded and lost part of his right hand. For this gallant action, he was awarded the George Medal. He received the Order of the British Empire for World War II service. He went on to serve as director of the Casualty Rehabilitation Division of the Department of Veterans Affairs. In 1949, he became the founding national director for the Canadian Arthritis and Rheumatism Society which was to become the focus of his life’s work. He served on the national council for the CNIB, and was a member of the Board of Broadcast Governors. He represented provincial riding of Forest Hill (and later York Forest Hill) in the Legislative Assembly of Ontario from 1963 to 1971. He was appointed Minister Without Portfolio in 1971. After returning to private life, he served a member of the Governing Council of the University of Toronto and became the first President of the Toronto Sun. Queens’s University granted him an L.L.D. He received the Order of Canada in 1980. He died from cancer in 1981, at the age of 61.